I took a break from my drawing work last night (one book half done - YAY!) 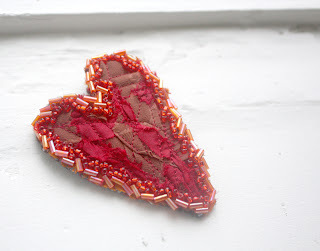 and made this Fall-colored fabric brooch. and the beads add more autumn tones. It's a beautiful time of year, for sure! I'm a little more north, and my trees are still mostly green. I got jipped.